No parking requirements for new multi-family housing developments is a growing trend in major cities across the country, and San Francisco seems to be light years ahead of this smart growth initiative. The California state government gave the green light to developments with minimal or zero parking when Governor Jerry Brown signed a bill in early October that reduced parking requirements for affordable, senior and special needs housing near public transit. Indeed, a recent report by Urban Land Institute suggests cultivating a car-optional community and highlighted walkability and transit as top priorities for Bay Area residents. San Francisco instituted its first parking regulations in 1955, catering to the needs of the automobile. Over the years the city has placed a number of parking controls and considerations to encourage alternative modes of transportation in dense areas. As early as 1974, when BART was born, more emphasis was placed on transit than the car. In 1998, the Mission Bay Redevelopment Plan was adopted, making it the first area in the city where there were no parking requirements. There have been number of parking reforms put in place over the years. In transit-rich corridors, mixed-use zones, and dense areas of the city, San Francisco has eliminated minimum parking requirements and placed a cap on the number of spaces that a developer is permitted to build. A recent article in Bisnow offers two examples of San Francisco developments sans vehicle parking. Cityspace 38 at 38 Harriet Street is a 23-unit building completed in 2012 with ground floor retail, secure bike storage and car-sharing. 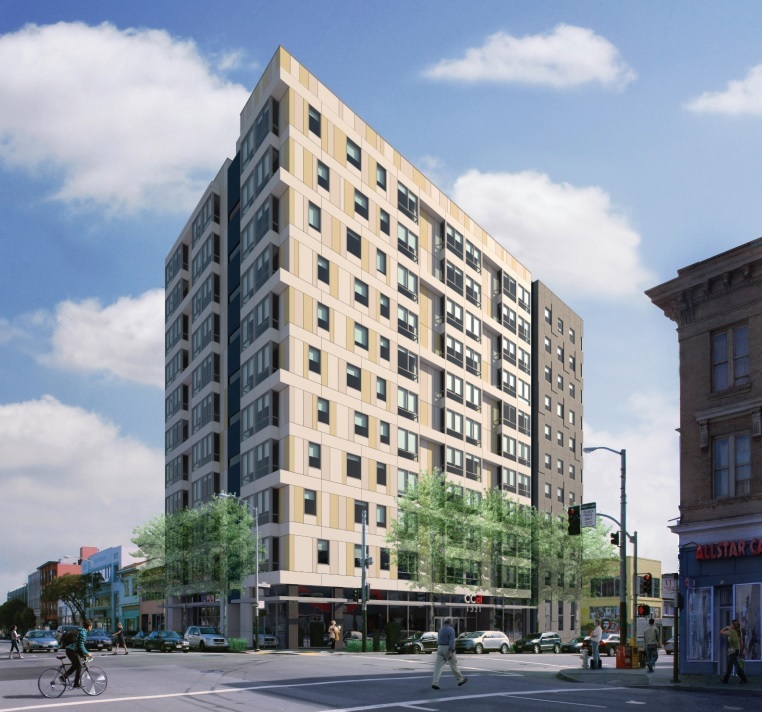 The same developers recently completed a larger scale project, The Panoramic at 1321 Mission Street (picture above) with 160 units, 4,000 square feet of commercial space and, that’s right, no parking. In congested areas and pedestrian-heavy corridors of the city such as North Beach, Hayes Valley, Rincon Hill, Tenderloin and Eastern Neighborhoods, residential off-street parking requirements range from no parking to zero to maximums. Parking spaces can also be limited for a certain number of residential units. For example, in North Beach the maximum is 0.75 parking stalls per dwelling unit. In the Van Ness Special Use District one space is allowed for every four dwelling units. Additionally, in certain zoned areas of the city, there is no parking requirement for some group housing, affordable housing or developments inhabited by the disabled and senior populations. San Francisco is still far from being a completely car-free city. The existing parking requirements assume residents are or will be less vehicle dependent. By default, easing parking restrictions can be less costly for developers and encourage people to take public transit, use car-share, Uber or Lyft, and walk or bike. It also maximizes land, but developing it for people instead of automobiles.